Adn wuz ai urs furebber at “shwimps”? *gibs kitteh a boal ob shwimps* Congas, pj! Ai no lykes swrimpees, yoo has toona alsotooaswell? so – what’cha got there?? Hmmmmm…..that looks innerestin’…what is it?! Long lost longtailold mousiee that Prysma send me!! yay!! So doan skroo dis up. Ai kud be skarrd fur lyfes. Aiz at dat tendur impreshnublol ayj, ykno. 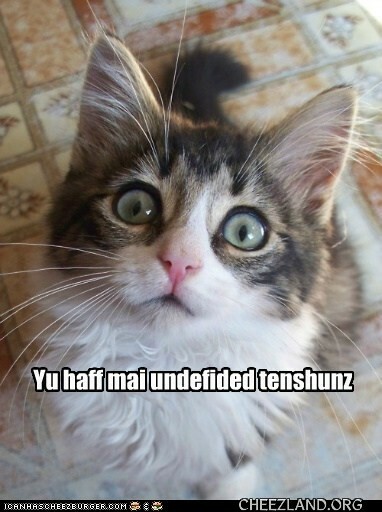 Yoo meen teh toona haz ur undebided atteshun. Ai iz jus holdin it. Gotta goe – hab 2 get mai iiez chekked. Bai!